all taken on or around July 8th. 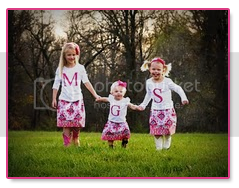 Happy Big 7 :) Your girls are so adorable. Happy Weekend. Happy birthday, sweet girl!! XO! That's so neat!! Happy Birthday, Mia! I just read the hair cut post, your girls are so great! I think they have the biggest hearts. The post about her wanting to donate supplies to the animal shelter for her birthday brought tears to my eyes. You have some wonderful ladies.